or Google Analytics before diving into the digital unknown. That’s why we’re introducing Learn with Google. Whether you’re looking to grow your business or just to be more productive, these short videos, handouts, and resources will arm you with tips that you can use right away. No login, registration, or payment required--it’s free and regularly updated. Online Fundamentals: Learn why having a website is critical for growing your business even if most of your sales comes from foot traffic and how to create an online marketing plan. Marketing Your Business Online: Master the basics of online marketing and search advertising to get more for your money. Learn how to choose the right keywords, write compelling ads copy, and optimise your advertising spend. Running Your Business Online: Learn how the ‘cloud’ and tools like Gmail and Google Docs can make your team more collaborative and your business more efficient. We also know that sometimes a conversation can help. When you’re ready to advertise on Google with AdWords, we’d love to hear from you directly. Our experts can work with you to create a campaign that fits your budget, and ensure that your new ads are seeing results. You can call us on 1800 988 571 during business hours to get started. Once your AdWords account is up and running, we’re eager to make sure that you’re getting the most from Google. There are various ways to contact us, so keep in touch! Of course, we don’t charge for these phone consultations but your mobile operator may charge for the call. With these new tools and support services, we hope that you’ll look, listen and learn how Google can help you grow your business. Many small business owners have asked us for one central place to go to get smart about Google products like AdWords or Google Analytics before diving into the digital unknown. That’s why we’re introducing Learn with Google. Whether you’re looking to grow your business or just to be more productive, these short videos, handouts, and resources will arm you with tips that you can use right away. No login, registration, or payment required--it’s free and regularly updated. out of preview to become a fully-supported Google product. With this major milestone we would like to showcase the Sydney App Engine team who have been working hard on App Engine for more than three years. App Engine, Google’s cloud application platform, enables developers to build and host web apps on the same systems that power Google applications. That means anyone can quickly develop and deploy web applications with simple administration and no need to worry about hardware, patches or backups. App Engine serves over 2 billion pages a day and powers not only popular apps like the the official Royal Wedding website but also Australian businesses like Ray White and Shoes of Prey. The Australian App Engine team includes software and site reliability engineers, developer relations and product and technical management. We work on new features, keep the platform running smoothly and support and engage the developer community. For all those that haven’t built a web application using App Engine before, you can see how easy it is by following our Getting Started Guide. Earlier this month the Google App Engine team celebrated coming out of preview to become a fully-supported Google product. a few early insights on retail search trends for this year’s Christmas shopping season. And from what historical data tells us, over the next five weeks shopping-related search traffic is really going to accelerate. Over the previous few years, searches for "Christmas" specific questions have climbed fast starting the third week of November. Thus far searches are up year over year in all major retail categories. This year’s big winners include mass merchant retailers (searches up 47%), food and drink (+31%), and toys (+28%). During the first week of December, shipping windows for international online retailers traditionally close and searches for domestic online retailers rise. 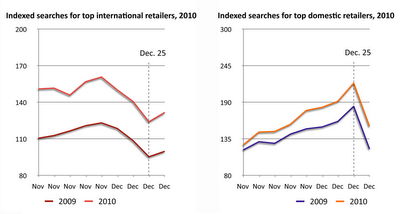 Two weeks before Christmas, searches for store names plus ‘trading hours’ or ‘location’ begin to rise dramatically. Last year, searches for trading hours grew nearly 250% in the last two weeks before Christmas. This year, such searches are already up 37% year over year -- and over a third of these searches now comes from a mobile device. Around December 16th, the last day Australia’s online retailers can guarantee delivery before December 25 and the last in-store retail weekend before Christmas, you can see another big spike in searches for store name plus “hours” and “location”. Here are three tips from Google for retailers who are reviewing their online ad strategies for the holidays. 1. Review your search ad budget & timing: Santa brings a big increase in shopping search traffic -- make sure you don’t run out of search ad budget too early in the day. Last year, some Google advertisers used up their daily search ads budgets only 1/3 of the way into the Christmas trading day because their daily ad budgets were the same as the middle of the summer. That’s like forgetting to put your most popular product out on shelves during the busiest season of the year. 2. Anticipate key shopping days: Try to anticipate when your customers will be researching and buying gifts online and when they’ll be looking for stores. For example, if you’re a large retailer you may want to focus your search ads on e-commerce queries until mid-December and then shift to ads featuring in-store promotions, maps, and trading hours thereafter. 3. Be ready for mobile: Mobile shopping searches have risen 220% year over year. All retailers should be ready with mobile-friendly websites that prominently display store hours and locations to accommodate people looking for their stores on mobile. Already, over 30% of such searches come from mobile, and we expect that number to rise further during the crucial last 14 days. Earlier this month, we shared a few early insights on retail search trends for this year’s Christmas shopping season. And from what historical data tells us, over the next five weeks shopping-related search traffic is really going to accelerate. program alone we’ve seen over 25,000 businesses sign up for a free website. But getting online is just the first step -- and fortunately there are hundreds of developers, designers, and agencies around Australia who can work hand in hand with small businesses to create and manage their online presence and help with their online marketing. Last year we launched the Google Engage program to provide educational resources and training to help these organisations serve their clients better. Over the last two weeks more than 300 advertising, web design, and creative agencies attended our Google Engage for Agencies masterclass series to learn new techniques for helping their clients succeed in the digital world. At sessions held around the country in Brisbane, Perth, Melbourne, and Sydney, we brought the latest updates on Google advertising products like AdWords. We opened the day with insights into the online behaviours of Australians, pointing out the explosive growth in mobile devices as Aussies access the internet while they’re on the go. Today only one out of five businesses with a website having a mobile-friendly version. Agencies can help small businesses ensure that their websites load properly on smartphones and tablets, make use of click-to-call links, and include critical info like store location and operating hours. David Booth, a Google certified trainer from US-based digital agency Cardinal Path, then took the podium to share his more than 10 years of experience running an agency that manages online marketing campaigns for SMBs. He shared practical tips for how to improve a client’s return-on-investment from their advertising budget and gave advice on how to run your agency more efficiently. We also introduced the audience to the brand new Pages for Google+ offering, which is a way for organisations to connect with other people, brands, and businesses online. 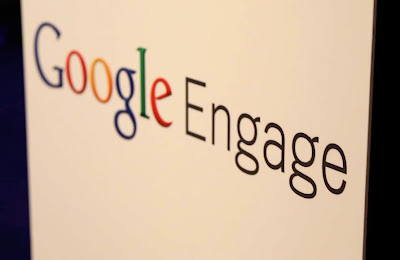 Google Engage agencies including Reload Media and Eminent Online Marketing have been quick to start taking advantage of Google+, as well as small businesses such as DUGG, a mens underwear retailer. Armed with new tips and tricks, the attendees are ready to go help Australian small businesses become even more effective in their online marketing. 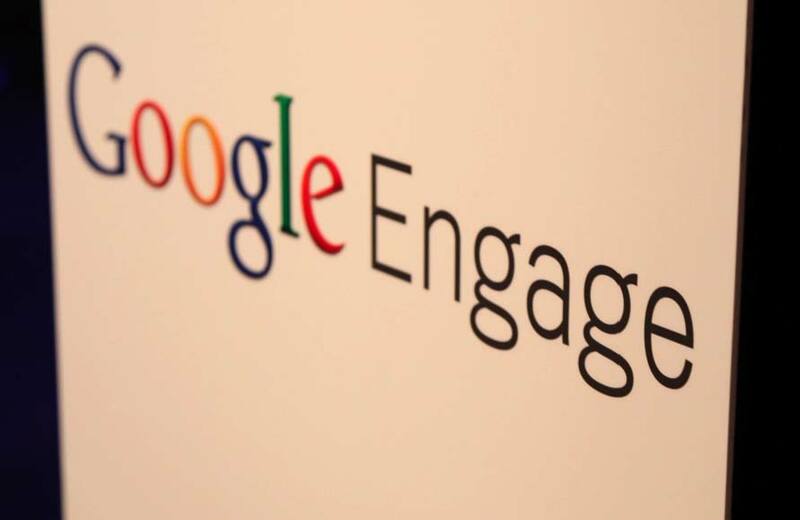 Going into 2012 we’ll be taking some of our training events to Hangouts on Google+ to speak with our Engage participants more frequently. Watch this space for updates. Over the past year, thousands of Australian small businesses have recognized how the Internet can help them market and grow their business. Through our Getting Aussie Business Online program alone we’ve seen over 25,000 businesses sign up for a free website. But getting online is just the first step -- and fortunately there are hundreds of developers, designers, and agencies around Australia who can work hand in hand with small businesses to create and manage their online presence and help with their online marketing. Seven years ago Hobart motorcycle mechanic Mark Lesek lost his arm in an accident. Unhappy with the prosthetic he was given, Mark used Google Search to find patents and designs -- from the early 1900s -- to build a new one. As the waters moved in and destroyed countless homes during the Queensland floods helicopter pilot Mark Kempton and his team rescued 43 people from roof and treetops. With streets and landmarks submerged, Mark turned to Google Maps on his mobile to find people in distress. The heroism of Mark and his team has recently been recognised with a Pride of Australia award. Professor David Kennedy from the University of Western Australia uses Google Earth to scan thousands of square kilometers in Saudi Arabia and Jordan to discover ancient ruins. Most recently he uncovered thousands of prehistoric man-made stone structures across the Arabian peninsula -- without leaving his desk. You can see more inspiring search stories from other people around the world on Search Stories. We’re constantly inspired by our users and how they rely on Google products to achieve the extraordinary. Today I want to share three amazing Australian stories. we highlighted some of the most interesting statistics about how Australians use their smartphones, including the fact that Australia has the second highest smartphone penetration in the world. Today we’re making it possible for anyone to dig through the thousands of data points that we collected, to come to your own conclusions, with Our Mobile Planet. This new website features an interactive tool that anyone can use to create custom charts that will help them understand the mobile consumer better and make the right decisions on their mobile strategy. Extensive data: See the penetration of smartphones across 30 markets, where and why people use smartphones, and what they do when they’re using them. Also get stats on mobile commerce behavior and perceptions of mobile advertising. Powerful comparisons: Easily select multiple statistics and multiple countries to compare with one another. Easy graphs: Once you’ve selected your data points and countries, it’s just a click of a button to create an image to embed in a presentation, or to download the data into a spreadsheet. Segmentation: Cut the data by age, gender and/or intensity of internet usage. To get started, visit www.ourmobileplanet.com. Posted by Ryan Hayward, Product Marketing Manager, Asia-Pacific. A few weeks back we highlighted some of the most interesting statistics about how Australians use their smartphones, including the fact that Australia has the second highest smartphone penetration in the world. Now, 4500 doodles later, we can announce the winning doodle! His doodle was chosen by the original Google doodler Dennis Hwang, who appreciated the doodle’s skill and creativity, as well as the optimistic message and tone. “The longer you look at it, the more things you discover within it, which is not always easy to pull off,” he said. Timothy’s doodle will be featured on google.com.au early next year. Three of the age group winners spent yesterday at the National Portrait Gallery in Canberra. Damian, Timothy and Christina were given a behind-the-scenes tour of the of the gallery and exhibitions and had their very own special portrait taken by the gallery’s multimedia expert and resident photographer Mark Mohell. The young doodlers also saw their work in a special digital display of the 32 doodle state and territory winners. The day was not without drama when one of our age group winners, Ineka, missed the morning tour due to an earlier emergency appendectomy. But proving that you can’t keep a good doodler down, she came directly from hospital to accept her trophy in the afternoon. The NPG will arrange her own personal tour of the gallery when she’s up and about. Thank you to all our thousands of doodlers from across Australia, and look out for Timothy’s doodle on our homepage. Posted by Leticia Lentini, Event Marketing Manager, Google Australia. in September, Australia has the second-highest smartphone penetration in the world. And by the end of this year, more than 50% of Australian adults will own a smartphone--just in time for Christmas. They’re using those smartphones to research gifts and contact local businesses. 1 in 5 sometimes even bypass the PC to make online purchases directly via their mobile phones. So what does this mean for retail? To start with, it means that more people are looking for them, in more ways, and in more places: on the bus, from the train, even from the sofa while watching TV. At the same time, it means Australian businesses can’t afford to ignore mobile--without mobile-friendly websites, they’re invisible to the shoppers who’re trying to find them. The good news is that it’s fine to keep it simple--there’s no need to rush to build complicated mobile e-commerce websites or expensive mobile apps. 49% of the Australians we surveyed had used their smartphone to research and then call local businesses, while 45% visit a local business they’ve found using their smartphone. That means that most businesses can start by making sure their location, contact information, and opening hours are accessible on mobiles. The Christmas season is a marathon that ends in a sprint, and there’s lots still to be learned from how people search. So stay tuned for updates as the shopping season unfolds. While Christmas Day may be 6 weeks away, the Christmas shopping season is already in full swing, and everyone wants to know what’s in store for the millions of businesses, shops, and retailers looking forward to a very busy Christmas. We may not have a crystal ball, but we do have a good sense of what Australia’s Christmas shoppers are searching for online. So we started crunching the numbers to see what we could learn about how people are searching and shopping this year. We discovered some interesting facts. First of all, 2011 is retail’s biggest year yet online--even bigger than the record-setting online shopping season driven by the strong Aussie dollar last year. Year over year, shopping-related searches are up 29%, making it more important than ever for businesses who want a piece of the action to get online. However, it looks as though this year’s true Christmas miracle is mobile. While retail has posted impressive gains over last year’s season, the number of shopping queries coming from mobile devices increased 220% year on year. In fact, one quarter of all Christmas shopping-related Google searches this year now come from mobile devices. This growth may be dramatic, but it probably shouldn’t come as a surprise. As we revealed in September, Australia has the second-highest smartphone penetration in the world. And by the end of this year, more than 50% of Australian adults will own a smartphone--just in time for Christmas. They’re using those smartphones to research gifts and contact local businesses. 1 in 5 sometimes even bypass the PC to make online purchases directly via their mobile phones.
. We wanted to celebrate the intersection of creativity and technology by bringing together people who excel on both sides of that equation: creatives and planners from Australia’s top agencies, big thinking advertisers, and developers with awesome skills in areas like mobile, HTML5, social, local and gaming. 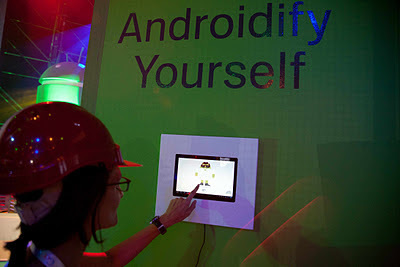 More than 400 people came to the event to discover how Google technology can bring creative ideas to life. They played with creations like helicopter view for Google Maps, the new eBooks offering, and the Android-based game We Draw on a Google TV. There was plenty of interactive fun at the demo zones. Visitors interacted with our green screen to become part of YouTube classics like Beached Az, Tipp-Ex, or Volkswagen’s “The Force”. They could also get Androidified and take home a postcard souvenir. New York-based Aussie and Google marketer Ed Sanders took the stage to share his golden rules for amazing creative campaigns: Know your users, know the magic of your product, and connect the two; innovation doesn’t require invention; real stories are better than fake ones; show don’t tell; and fast is better than slow. The Communications Council also announced two new initiatives that bring your creativity to technology, developed in partnership with Google. Show & Tell is a gallery-style YouTube channel curated by AWARD, which will showcase the best creative work from Australia and New Zealand. They also shared an early demo of Trapeze, a web platform designed to help developers and creative types connect and collaborate. For more from Google’s Creative Sandbox, put this page into one of your circles on Google+. 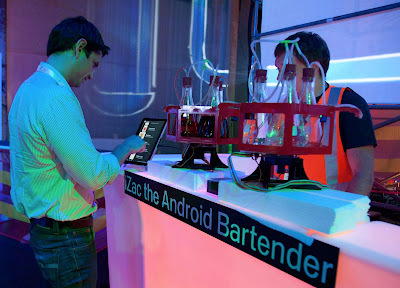 Last night at the CarriageWorks in Sydney, Google Australia hosted Creative Sandbox. We wanted to celebrate the intersection of creativity and technology by bringing together people who excel on both sides of that equation: creatives and planners from Australia’s top agencies, big thinking advertisers, and developers with awesome skills in areas like mobile, HTML5, social, local and gaming. Google Developer Day in Sydney was a panel discussion on venture capital and entrepreneurialism. Getting an idea off the ground takes as much business judgment as it does technical know-how, so we brought in a few experts that have been around the block with a start-up or five. Rebekah Campbell, founder of Posse told us how it took one-and-a-half years and “more than 1000 meetings” to raise enough money to get her idea off the ground. She talked about the various forms of funding sources, such as government grants. Many in the audience asked Mick Liubinskas, co-founder of Australian angel investor group Pollenizer, about the do’s and don’ts of attracting investment. His advice? Do be stubborn about sticking to your vision. But don’t wait forever to launch. A fast launch is essential to testing your idea or concept. And don’t be so inflexible to not consider a different approach. Scott Farquhar from Atlassian told us about the importance of keeping focus and how making lots of mistakes are okay (such as opening up, and then quickly closing, a New York office after realising it was in the wrong place). Just make sure the mistakes aren’t fatal ones, he says. What came out strongly in the session is that you need to take the leap and not be afraid of failure. While Australians celebrate success, we do not do so well at embracing those who tried and failed. Business people who lead failed companies are too often tainted with innuendo of wrongdoing, when we should look to them as pioneers who can bring wisdom to their next venture. At Google we say: “fail fast and iterate.” We cultivate an environment where failure is fine, as long as you do it quickly and learn from it. Behind most people’s stories of commercial success are often a history of start-ups which didn’t go the way they intended. Just ask Pollenizer’s Mick, who has worked on 150 businesses - not all of them hitting the mark. At the event I asked how many people in the room wanted to do a start-up one day. Three-quarters of the 100+ crowd put up their hands. So the good news is that there’s certainly no shortage of budding Aussie entrepreneurs wanting to give it a go. Posted by Alan Noble, Engineering Director, Google Australia. In amongst all the technical workshops at yesterday’s Google Developer Day in Sydney was a panel discussion on venture capital and entrepreneurialism. Getting an idea off the ground takes as much business judgment as it does technical know-how, so we brought in a few experts that have been around the block with a start-up or five. This morning we launched Google+ Pages on Google+. This means that the businesses and brands you care about -- whether it be your local pub, footy team, or TV show -- can soon create their own page on Google+. You can recommend them by giving them a +1, or you can add them to a circle to follow their updates. Some early examples of Google+ Pages include Burberry, X Games, and The Muppets. (In fact, the Muppets are doing a live Google Hangout on Google+ this morning.) We have also created some other pages for ourselves, including an official page for Google as a whole and products such as Android and Chrome. Any Aussie business, brand, or organisation will soon be able to join the community at plus.google.com/pages/create. Add Google Australia to your circles. , and whether you’re a bookworm or casual reader, you’re invited to stop by and stock up on some great reads for summer. We've got hundreds of thousands of titles to choose from, including plenty of bestsellers, and millions of free eBooks on top of that. It's easy to find great Australian authors like Kate Grenville, Thomas Keneally, Geraldine Brooks and Christos Tsiolkas. Google eBooks is all about choice: we’re offering more titles and more ways to buy, access and read them, so that your library is literally at your fingertips. You can choose from great titles from hundreds of local publisher partners at launch, including award-winning publishers like Allen & Unwin, Scribe and Text Publishing, not to mention the many thousands of international publishers Google works with around the world. In addition, we are working with some of the best local booksellers in Australia, including Booktopia and Dymocks who are selling eBooks today, with QBD The Bookshop and The Co-op Bookshop coming soon. Plus, choose your favorite device for any occasion. You can discover, purchase and read our eBooks on almost any device, including your PC or netbook; Android and Apple smartphone or tablet; or pretty much any eReader, picking up at the same spot that you left off as you move from one device to another. We're also pleased to report that with our Australian launch, we are opening up our Google eBooks affiliate program in Australia, Canada and the UK. The affiliate program allows retailers, bloggers, book publishers and other website owners to earn commissions when they refer their users to Google eBooks. To learn more, please visit our Google eBooks Affiliate Integration Help Centre page. We’re happy to make it even easier for all Australians to discover, buy and read their next great book. Head on over to our new eBookstore, visit one of our great retail partners, or check out the new books tab on the updated Android Market and get stuck into your next amazing story today. Today, Google eBooks has landed in Australia, and whether you’re a bookworm or casual reader, you’re invited to stop by and stock up on some great reads for summer. It’s just one more sleep to Google Developer Day in Sydney. We’re hard at work preparing to welcome over 1200 developers to Google Developer Day in Sydney tomorrow. For the uninitiated, Google Developer Day is a one-day event featuring advanced technical talks and workshops on Google platforms and products. There’s a great line up exploring the latest developments in Android, Chrome, HTML5, Google’s cloud technologies, Google+ and more. For example, there will be sessions on Building Integrated Applications on Google's Cloud Technologies, Bleeding Edge HTML5 and High-performance graphics for Android. We’ll also be hearing from some Aussie and Kiwi entrepreneurs on what it takes to run a successful start-up, as well as hearing from a diverse group of speakers in the ever-popular Ignite lightning talk sessions. You can see the full agenda here. We’ve already showcased the finalists of the Google Developer Day Open Call HTML5 challenge, and tomorrow we will showcase the finalists of the Google Developer Day Open Call Android ADK challenge. Be prepared to be impressed by an UAV, a rainbow predictor and cocktail-mixing machine all developed on the Android platform. For those who are in town early, there’s a Sydney GTUG meetup tonight. If you can’t be at the event, you can still download the GDD Android app, follow the speakers and local Googlers circle on Google+ and follow the hashtag #gddsyd there or on Twitter. vote for your favourite doodle. Now we can announce the winners in each age group. Congratulations to the winners who have scored an interactive whiteboard for their school and a laptop for themselves. The four will be travelling to Canberra to spend a day at the National Portrait Gallery where they’ll get a behind-the-scenes tour. Now it’s up to Dennis Hwang, Google’s webmaster and original doodler, to select the national winner whose doodle will be displayed on our homepage for 24 hours. A few weeks ago we asked you to vote for your favourite doodle. Now we can announce the winners in each age group. We have some good news today for Australia’s virtual explorers. We have added hundreds and hundreds of new sites around the world for you to explore, ranging from temples in Taiwan, castles in Ireland, French chateaus, and snowy slopes in North American mountain ranges. You can walk around Italy’s iconic Leaning Tower of Pisa and try to find angles where it looks perfectly straight. For years we have had the streets of Amsterdam on Street View, but now you can also enjoy an all-out full-out recreation of The Netherlands in Nagasaki, Japan at the Huis Ten Bosch Theme Park. Over the last few years, Google Maps’ Street View service has helped Australians plan out routes to new locations, search for real estate online, and pick out visually memorable meeting spots. But you can also use Street View to travel virtually around the world. Global adventurers once shared their photos of far-away destinations with jealous friends, but now with Street View, those friends can walk around the same foreign lands and see famous tourist destinations like they were right there. If the number of Google searches a horse gets is an indicator of our favourite for the Melbourne Cup, then “Americain” is racing ahead. In yesterday’s search analysis of Melbourne Cup horses, Americain took the lead in the rankings, but a number of other thoroughbreds were galloping closely behind including, “Jukebox Jury” and “Dunaden”. As we know, race-day fashion can draw almost as much attention as the race itself. Online searches for fascinators have increased consistently with online searches for the Cup. There have been more searches for the fashionable headwear throughout September and October than any other time of the year, but surprisingly, hats top the number of searches for headwear, including a dramatic rise in the search for men’s top hats. In Google Image searches, Melbourne Cup fashion was in the lead until the final horses were confirmed. Over the weekend and today Australians have been searching for images of the horses they will put their money on. As for who’s searching for the Cup online? Interestingly, the ACT beats out Victoria in terms of regional interest in the Melbourne Cup, followed closely by Western Australia. Happy Melbourne Cup day from Google Australia! Posted by Kate Mason, Google Communications, Australia and New Zealand. smartly timing their AdWords campaigns to capitalize on the public’s perennial interest in all things spooky. ThePartyPeople is one of Australia’s most successful party supply stores, offering a large range of costumes, balloons and themed party accessories. About six weeks ago Dean started “flexing up” for the season by switching on his Halloween AdWords campaign and staffing up for increased customer enquiries. If you take a look at Insights for Search – our free tool to find out what search terms trend on Google at any given time – you can see what searches for Halloween have been hot this year. Unsurprisingly, most people have been looking online for costumes and costume ideas, followed by food, party games and decorations. The graph shows the growing interest of Aussies in Halloween. By matching his Google AdWords campaign to this trend, Dean got so many orders he actually had to ease up on his campaign in order to fill all the orders. Right through Halloween eve, Dean and his team were still busy trying to keep up with all the enquiries and sales requests that came in over the last few weeks. Make sure you’re online — no matter the device. If you don’t yet have a website, you can sign up for a free one at http://www.gettingbusinessonline.com.au/. You can add your business listing to Google Places on Google Maps. And don’t forget all those customers with smartphones and tablets; with Google sites for mobile landing pages, you can set up a simple site that’s optimized for smaller screens. Find and understand your peak seasons. Look up your products or services on Google Insights for Search to determine their demand over the year, and then tweak your keywords to correspond with trending topics. Riding a natural wave is a lot easier than trying to generate your own initial momentum. Connect with the hot topics. Can you easily link your product or service to a popular search topic? For example, if you own a costume business that sells items modeled after the latest superhero movie, you might want to advertise against search queries connected to the movie or superhero. Of course, you know your business better than anyone. But these tools give you a little extra data to help you make decisions. And a final Halloween tip? Even though Hollywood keeps pumping out vampire romances, Dean told us that Aussies have been much more into zombie costumes this year. And yep — we are seeing that exact same trend in Insights for Search. ‘Tis the season to be… scary! Halloween has come and gone again — the peak season not just for marauding ghouls and goblins but also for Australia’s costume and party suppliers. Here at Google we see a spike every year around this time in searches about Halloween topics. And we also see businesses like Dean Salakas at ThePartyPeople smartly timing their AdWords campaigns to capitalize on the public’s perennial interest in all things spooky.